We’ve been conducting public meetings for years. And it used to be easier. Present the plan. Discuss the plan. Talk about how your plan is better for the neighborhood/community/city/region and provide the conclusion. But things have changed. When did the public become planning experts? People appear at public meetings and talk about density and land use. They know how many units per acre are good…and bad. Of course, they tend to be wrong, as they do not discuss design. 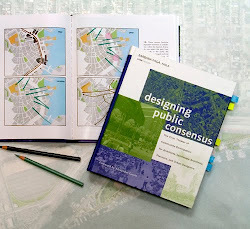 Still, public meetings have become the forum for the public to debate density with experienced planners and designers. Density has become a four-letter word. But mention sprawl and the public scoffs at the lack of sustainability. And they can’t have it both ways. The discussion needs to be about design and sustainability. My old favorite assignment for students was to find out the allowable FAR in major cities. As I recall, at that time the FAR in Atlanta was among the highest in the northern hemisphere. Students thought FAR was by far higher in Manhattan. Not so then. My new favorite assignment is to show photos and ask students to describe the density. Good design does not illustrate density. Density is a relative term that describes quantity, not quality. It is design that will make or break a project. By now you’ve figured out that nothing bothers me more in a public meeting than a debate on density. Neighbors in an Atlanta neighborhood with a density of about four units per acre argue that they have traffic issues and need light rail before there can be more development in the city. When we tell them they need a density of 15 to 20 per acre for transit, they cringe. It is not density and sprawl that is their issue—it is good and bad design. We have to change the conversation.